I've been scratching on guns now for many a year and have just stumbled on this forum. 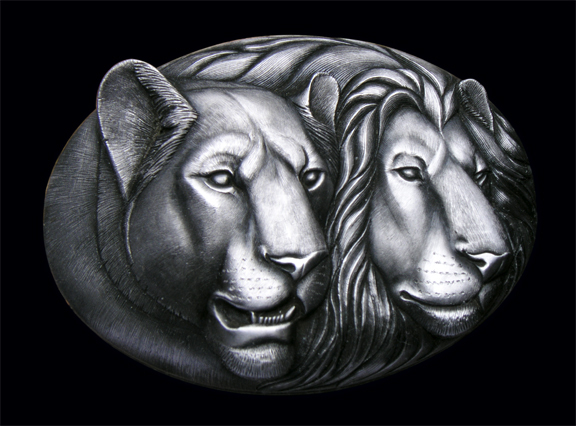 I just want to say how good it is to see that the engraving interest is strong, and with so many newcomers to the art. I'ts also good to see the beautiful work that you guys are producing! Welcome to the group Phil, You will find many members that are ready to help you if needed. The problem with doing nothing is knowing when you are done. Phil, it is indeed a pleasure to see you on the forum. Enjoy the group and watch it continue to expand! Regards, Sam Welch. Any advice or comments you want to give would be most welcome. The occasional picture of your work would be great also! Thanks for coming in for a visit. Also welcome Phil, I'm also very pleased to see you here. Hi Phil, welcome to the group it is an honor to have you with us. I still see your work and it is very beautiful. Thanks everyone for the nice welcome and kind comments. Tom invited me to post some pictures, so here they are, I hope you like them! Welcome to the forum Phil. I have admired your work for many years and it is just getting better. 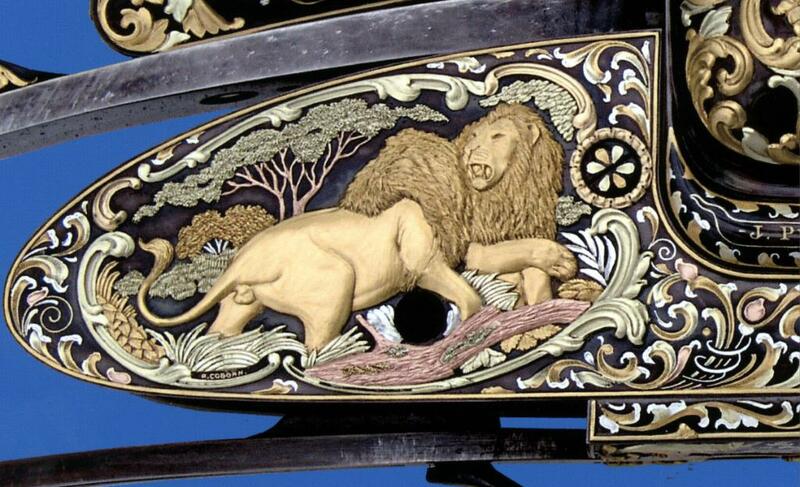 The pictures you posted are yet another proof that the finest arms decoration ever created is being done now. 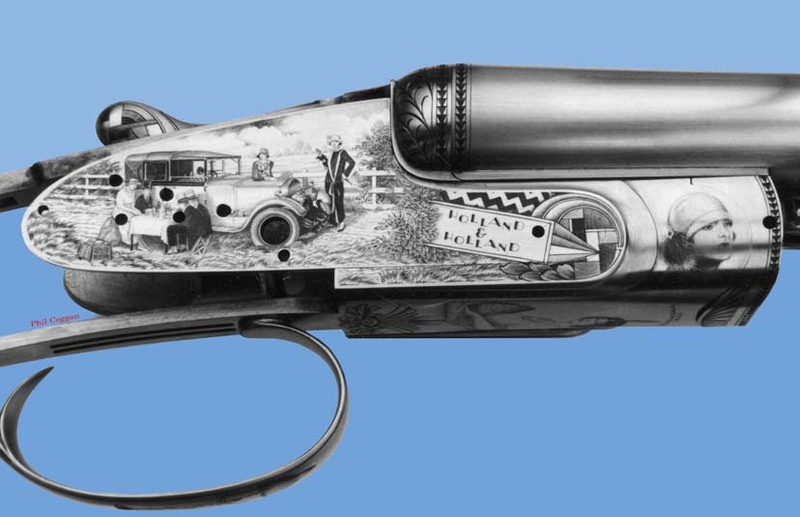 My first book about engraving was James Meek’s “The Art of Engraving” and that got me hooked. It’s a real honour to meet you. Andrew, I see you are awake! Yip, I'm awake..... well sort of !!!! 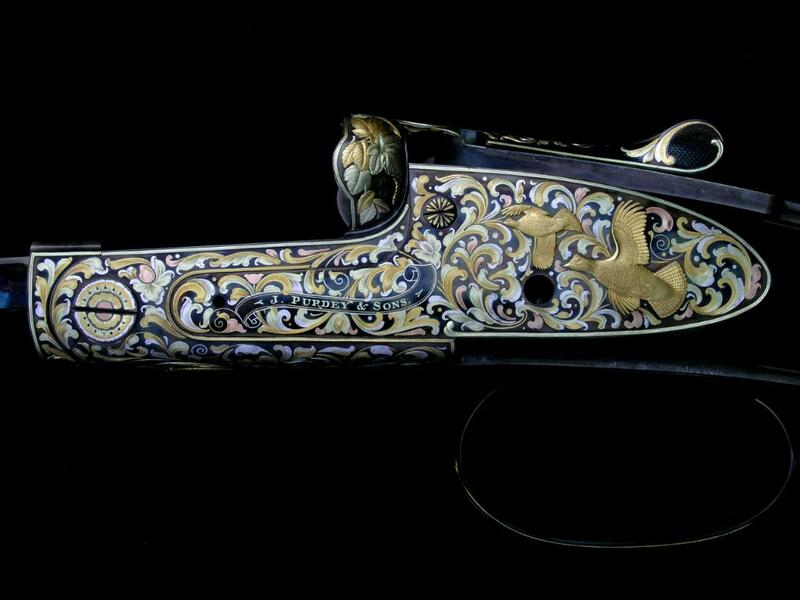 It was more or less the same for me, but I was interested in flintlock guns, at that time I could'nt afford to buy them so I tought myself to make them. After a while my interest focused more on engraving, it was a lot easier than making the guns, you see I did'nt have access to milling machines etc, So it was all hacksaw and files! 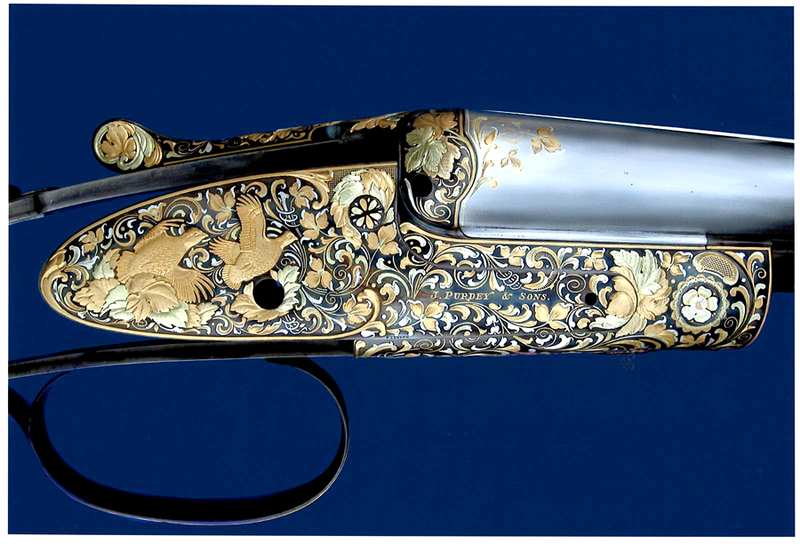 It was'nt until I saw one of Mario Abbiatico's first books 'Modern Firearm Engraving'. that I realalized what engraving was all about. The next problem was, how does one produce 'black' and 'grey' as in the photos? Anyway without boring you too much I practiced and practiced and finally sent some plates to Mario, he liked them and included them and some other work of mine in his next book 'L'incisione delle Armi Sportive'. You'll see a very young PC in there, and note the vice, an ordinary engineers one! My engraving studio....my kids bedroom! Ahh….The kids bedroom!!! Yip I’m the same……… but ours did the courtesy of leaving home first. The bedroom is now the workroom!!!! As for flintlocks, well, I made my own 50 cal one as well. It weighs a ton, isn’t particularly accurate, but I still shoot it just for fun. It was a lot of fun making it but a lot of work!!! 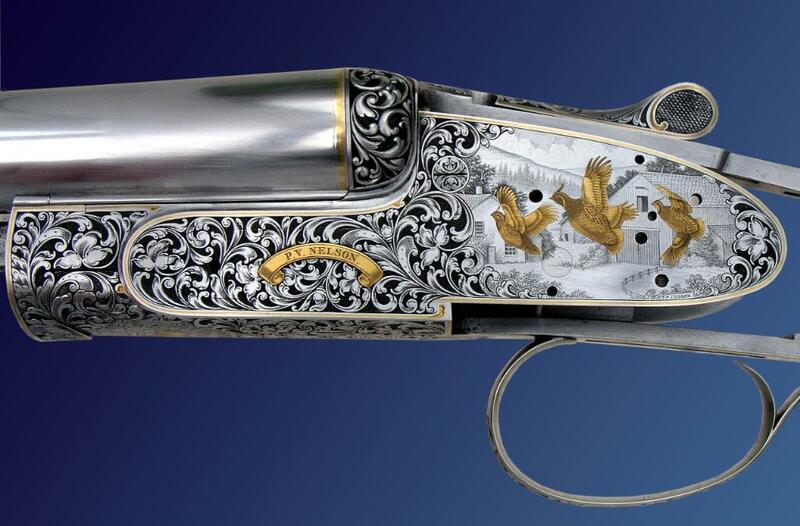 I read that your son Simon engraved as well…is he still engraving as a career? As I write this I’m watching on TV the Queens thanksgiving tribute to Sir Edmund Hillary in London and his laying up of his Knight of the Garter banner. A very nice gesture for the Queen to honour one of New Zealand’s greatest sons. You'll see a very young PC in there, and note the vice, an ordinary engineers one! My engraving studio....my kids bedroom! I'm Looking at your picture in the book now and it is the first time I noticed the rabbits, mice and puppies on the wallpaper! Like you, I started out on an ordinary bench vise but at least mine could swivel at the base. The one you are using in the picture looks completely stationary. Did you move that whole wooden block it is mounted on or did you have to move around the vise? If you still have those plates from 1982 I'm sure people here would like to see them, they are beautiful and done without microscope, air assist or ball vice! The vice was the only one I had, and yes I had to walk around it! The plates were sent to Mario and are still over there in Italy. As for a microscope, I don't use one, just a 10X loop and 4X magnifying glasses. I also don't use air assist, but I do have a ball vice!!! 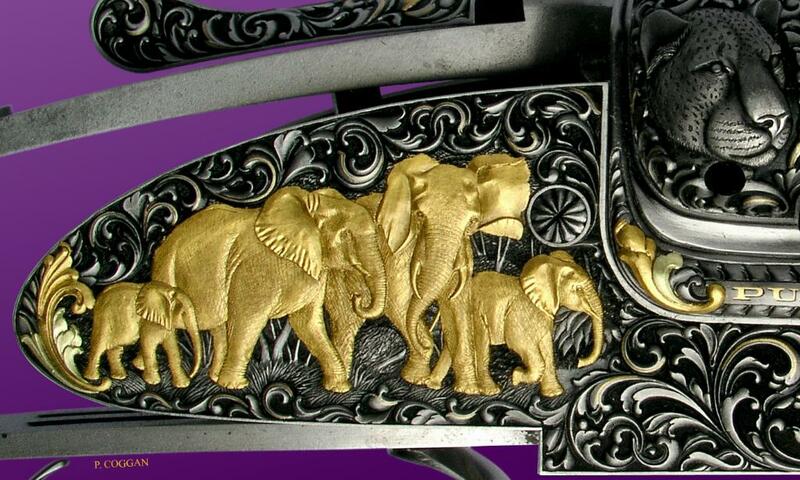 Look foward to learning and seeing more..
Simon is still engraving, mainly for Purdey, H&H and Greener. He's doing very well. He works with me in my studio but has his own work. Well, the apple dosn't fall far from the tree. That's stunning work by Simon. 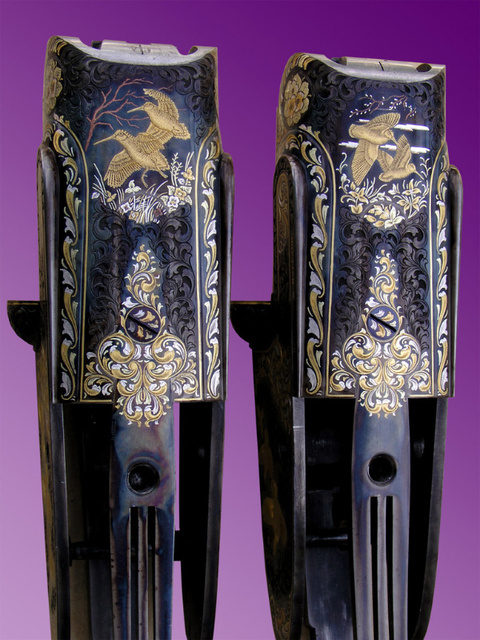 When I was in Reno at the FEGA (Firearms Engravers Guild of America) convention there was a really interesting family that I talked to. 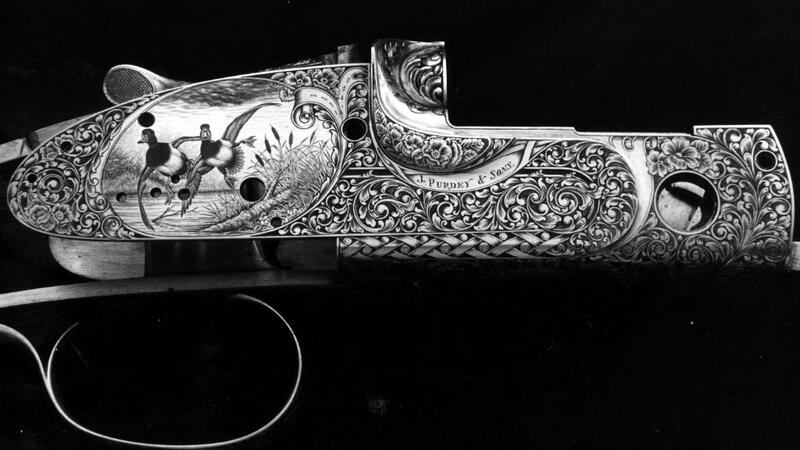 The Father was a 3rd generation stock/gunmaker and his daughter engraved the guns. They both worked out of the same workshop/studio as well. A family affair!!! walkabout vise. Keep up the good work. scratching... SCRATCHING? What beautiful work. The possibility of being able to do some acceptable scratching on guns is what brought me here. Your work is quite impressive scratching. I hope some day I can do a tiny fraction of that quality. Thanks for joining us and welcome! Thank again everyone, I was'nt expecting this! Andrew, Simon has had a big advantage with having someone say to him, ok, this is the tool you use, this is the way to sharpen it and this is the way you use it, having said that he spent a lot of time and effort and hard work to get where he is today, he often suprises my with things he comes up with. I have pictures of my studio and of other work that i've done in the past which I could post....but what I don't want to do is bore everyone!!! 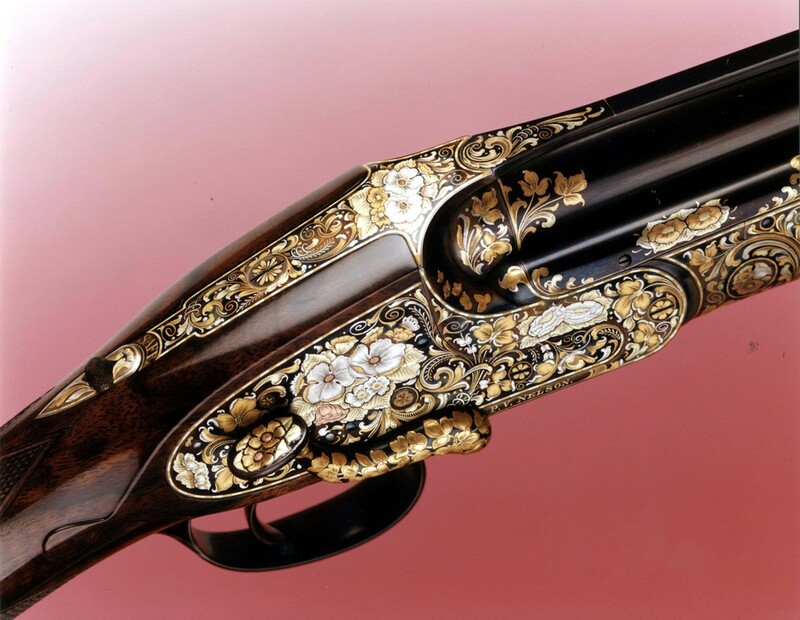 Phil, gun engravers, in my experience, don't get bored. Life is too interesting for that. The more of you magnificent work we can see the better...and that goes I am sure for your shop. I have long admired your work. You may be able to tell from my name that my family came from Wales, about 1750 I am told. Regards, Sam. Thank you again for posting and letting us see the photos of your work. You were talking about studios in bedrooms earlier in the thread. I was doing the same when I started. I had a single bedroom appartment and in the corner of the bedroom was the engraving bench. I do my best work in the bedroom. My wife Karla will kick me if she saw I wrote that sentence. Today is her birthday and so I better be extra good to her today. We are going out for lunch later for a small birthday party. Phil, no way would any of us be bored to see pictures of your studio and more engravings. I thought I detected a bit of Welsh accent there, whereabouts in Wales? I have some pictures of my studio and a few more of my 'scratchings' i'll post them later, it's been a nice sunny day here and i've just come back from a ride in the car, so there's only been about three hours work done today, gonna spend another half hour or so to finish off a pistol cap. I've heard that petrol in the UK is equivalent to about $9.50USD per gallon! I'm surprised anyone takes a drive at those rates. At $3.25 per gallon, we are pulling our hair out over here! Roger, I was curious about that also. Either it is an old car fun to drive or Phil has a masochistic streak we have yet to learn about. Phil, I have no idea what part of Wales my 4th great grandfather came from. I sure would like to know. Maybe someday I will come see Wales, but I for one will not hold my breath. 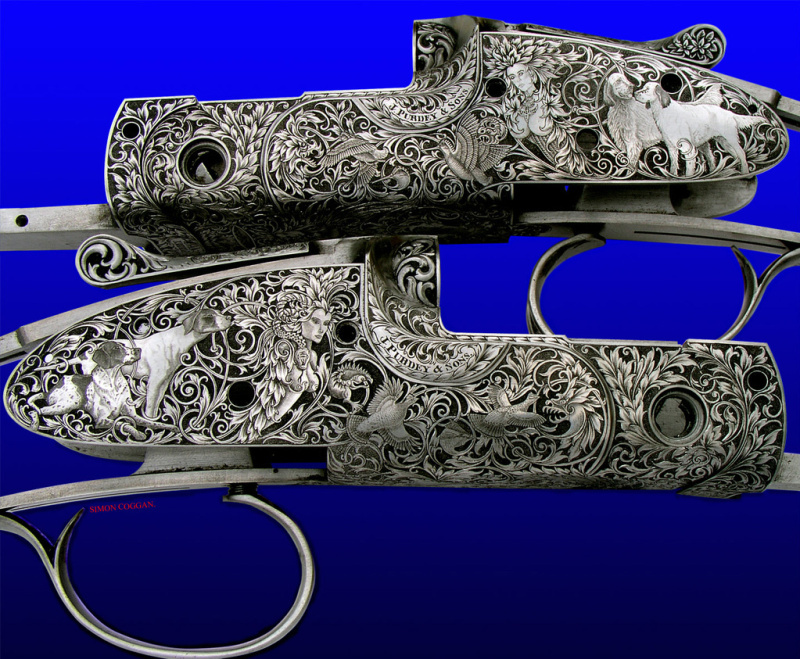 Some pics again, this time there are some real old ones, two guns from the 'African Hunter Series' these go back to the 80's, i've just finished the latest, it's based on Theodore Roosevelt, I can't submit the pics because there's going to be lots on it in the shooting mags, later this year. 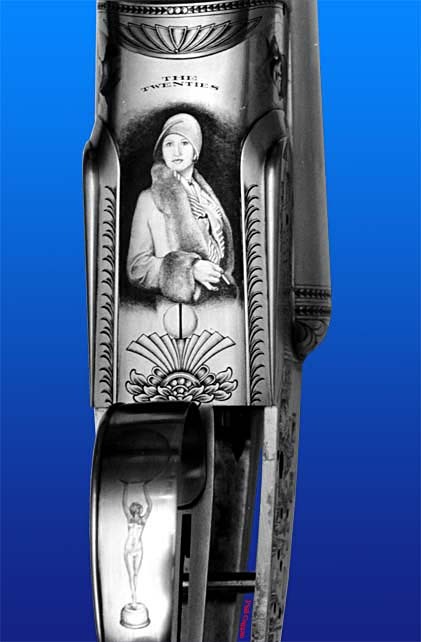 One of H&H's '20's pair, the portrait is taken off a Vouge front cover (1920's) I super-imposed the face of the lady that ordered the pair onto the models picture. If there's anything you would like to know about the pics/engraving etc. i'll try my best to answer your questions. By the way if you click on the pics they should open in Putfile where you can enlarge them, although some of them are scanned so the quality is not too good! Your work is really impressive - you definetly belong here on this forum. What graver system are you using? Does your son use the same, or both by hand? I really like your workshop with all that natural light. That's a very fancy looking turned base to your vice. Burr elm? I'm sure that's another customisable knick-nack that many scratchers would like to add to their tool kit. My vice was made for me by a friend, the base is oak, it took a few week to get properly bedded in. It's a little heavier than Simons Brownell vice. My workshop as you can see is in my loft, it's about 30' x 12', nice and airy, it does make a difference having somewhere comfortable to work! Danny, my graver system consists of a couple of hammers and a handfull of chisels, i'm afraid i'm 'old school'.
" HOW TO CREATE GAME SCENES USING PHOTOSHOP etc ". This would include, scanning in gun outline, importing and editing bird/animal pictures, scale-ing them down and positioning them etc. What do forum members think of this idea? I would say that is a great Idea. It is a great idea. I have done some of that in my limited opportunities to do game scenes. I Would love to see how you do it. You mean you haven't started making the presentation yet??? This couldn't come at a better time, I'm trying to figure a way to do this myself with Corel. I had better get photoshop I guess. Thank you in advance. I don't know Corel, but I assume it has layers? I would be really interested in seeing that Phil. : Ok, i'll try and get something together over the weekend. By the way Barry, it's nice to speek with you again.......Barry came to see me last year, I don't think he had anywhere else to go that day. That would be very generous of you and i am sure it will be much appreciated. I've had a few messages saying that my pictures on page one were'nt enlarging properly in Putfile so i've reloaded them. Phil, The pics are very nice and clear now. Super! Thanks for making them show larger. I am quoting your earlier post with these pictures so they will show in this post too. CREATING A GAME SCENE USING PHOTOSHOP. I'm going to try to show how I create a gamescene, it is not a magical 'quick fix' that automatically conjures up a fantastic scene! 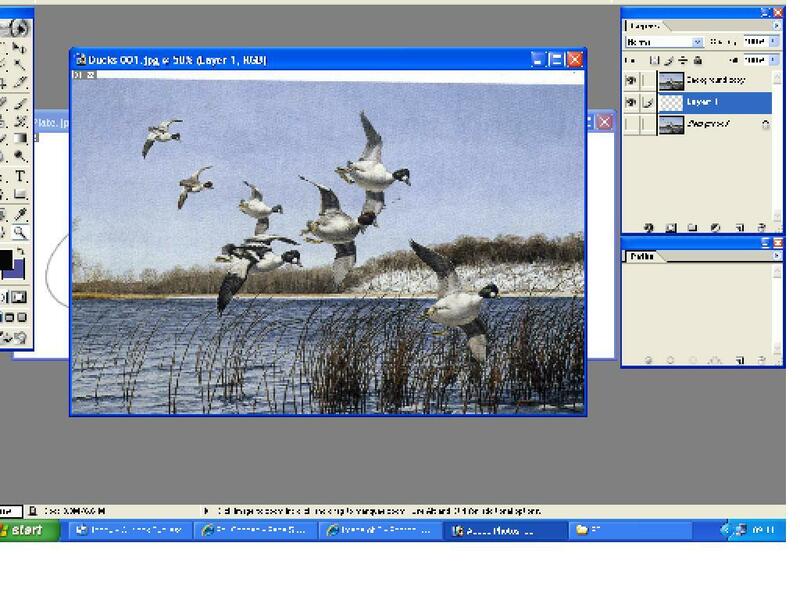 What I hope it will do is show engravers that are having some problems arranging birds etc. onto a lockplate. I'm using a step by step approach, this may be a bit boring for seasoned PS users, but bare with me it's aimed at those not familier with this program. What has to be remembered in PS is that the layers are like pages of a book, ie. No. 1 layer lays on top of No. 2 and so on, also, a layer cannot be worked on unless it is selected, ie. Blue. First, scan in the bird / animal picture that you want to use, the one i'm using is for demonstration only. Next, draw around the lockplate using tracing film, and scan into 'My Pictures'. 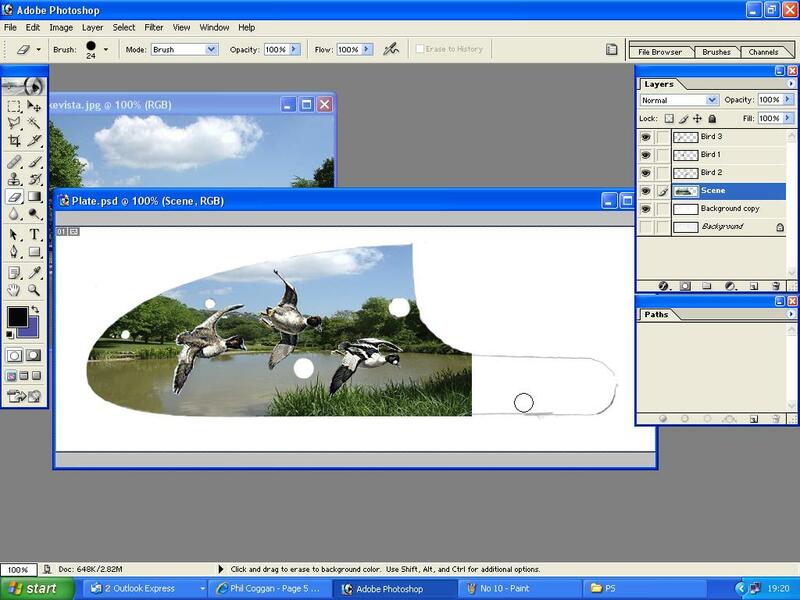 Open Photoshop, and check that the tools are on the left and Layers and Paths are on the right, if thier not visible click Window > Layers / Paths. Double click on the grey background, this should open My Pictures. Double click on the 'Plate' image to import it. In the Layers box grab the Background layer and drag it to the New Layer icon next to the Bin. This will create a new layer, unclick the eye of the locked layer. Clean up the plate image by, ( Top tool bar ) Image > Adjustments > Brightness / Contrast. Drag the Brightness slider to about + 20 and the Contrast to about + 40 > OK. ( Makesure 'Preview is ticked. Double click on the grey background. Double click on the Birds image in My Pictures, this should open it in PS. Enlarge the box as before and select the Magnifying Glass in the 'Tools' on the left. Hold and click the + curser over the bird that you want to use to enlarge, in this case the bottom left one. Drag the Background Layer as before to create a New layer and untick the Eye of the locked layer. 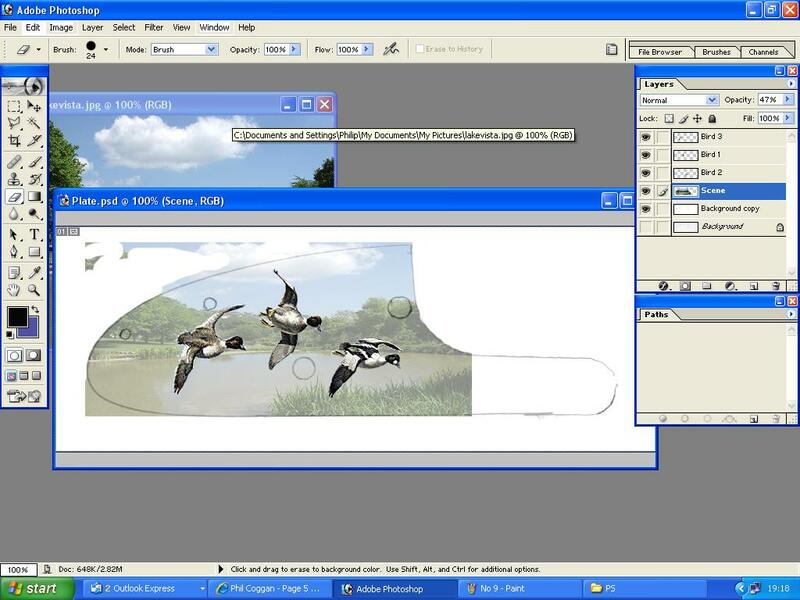 Click the 'Create New Layer' icon, next to the Bin, this will open an empty layer. Drag this Layer 1 to the Background Layer. You should now see Background copy on top, Layer 1 under it, with the two eyes showing. In the Paths box click 'Create New Path', the icon next to the Bin. 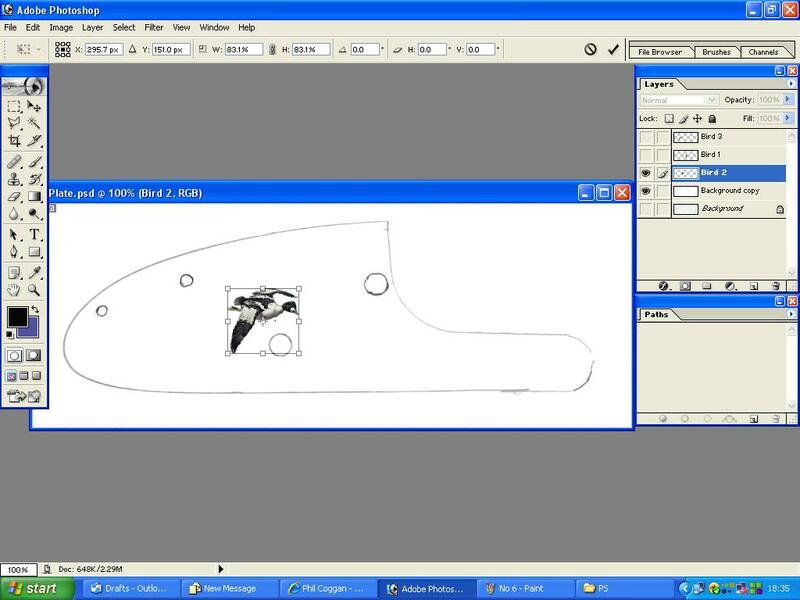 In the Tools Box ( left side) right click and hold on the 'Pen' > Pen Tool. 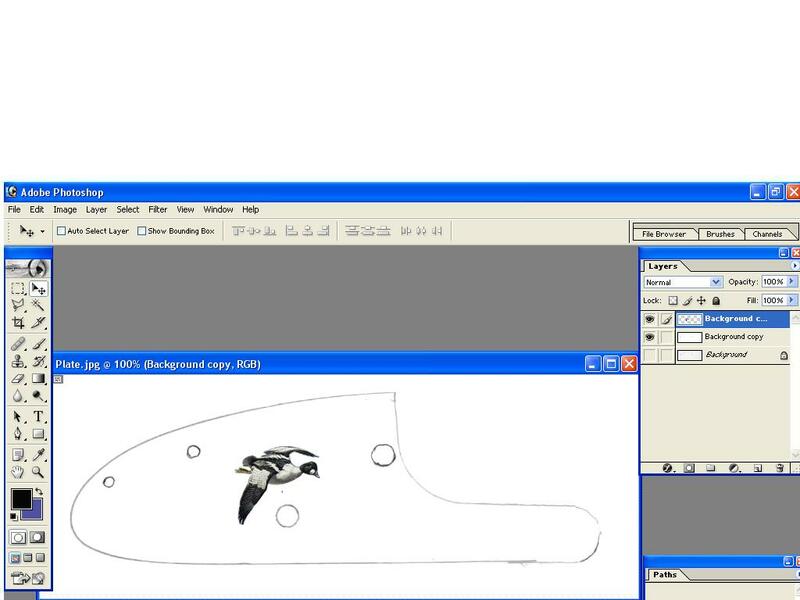 Click to add nodes around the outline of the bird, join up with the first one. you should now have a continuous line around the bird. In the Paths box the 'Load Path as a Selection' (The third icon from the left) This will make marching ants around the bird. Top tool box > Select > Inverse. In the Layers box select Background Copy ( Make it Blue ) Edit > Cut. File > Save As > Save. IMPORT THE BIRDS ONTO PLATE. Double click the grey background and import one of the birds. 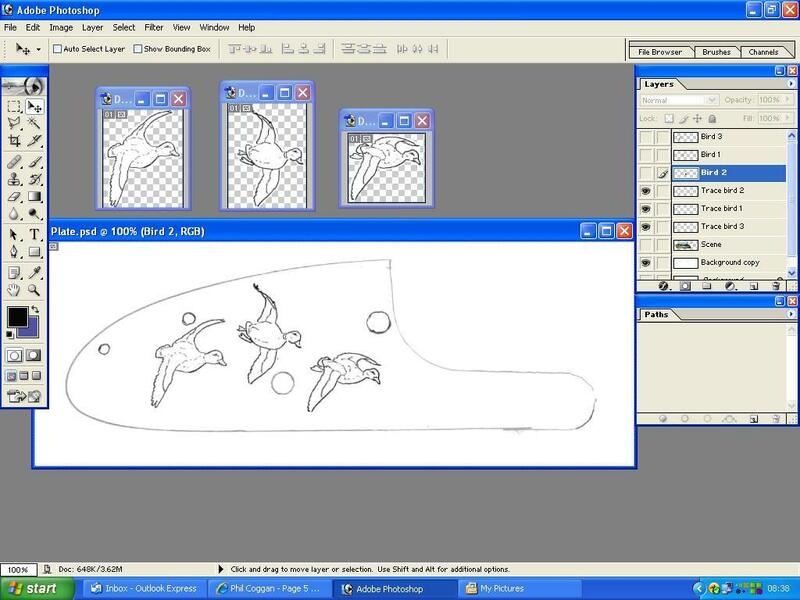 Select the'Crop Tool' ( Left Tool Box, third down on left. ) 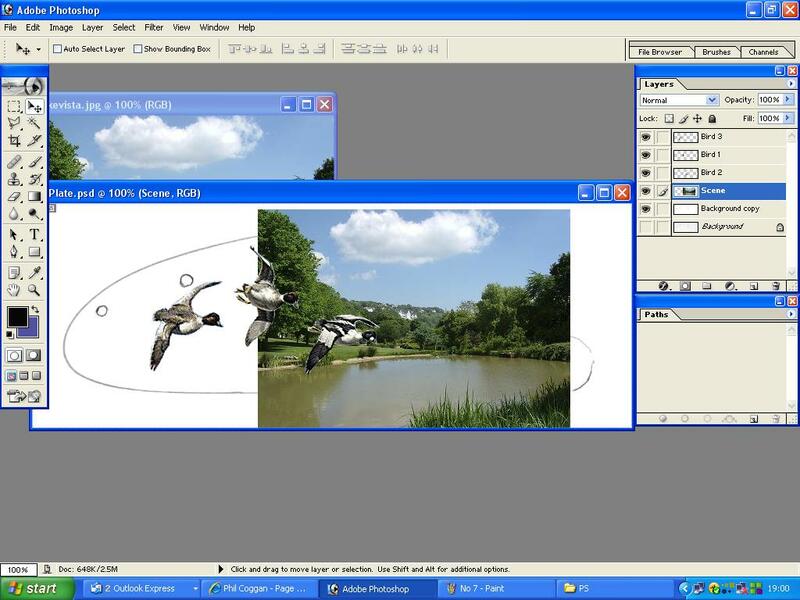 Hold the cursor on the top left corner of bird and drag to make a square. Drag the square nodes on the side of this box until the box fits snuggly around the bird. Double click in the centre of the bird. Image > Image Size. Set width to 0.4 inch > OK.
'Move Tool' ( Left tool box, top right.) Click on bird drag and drop it over the plate. Repeat the above until all the birds are on the plate. 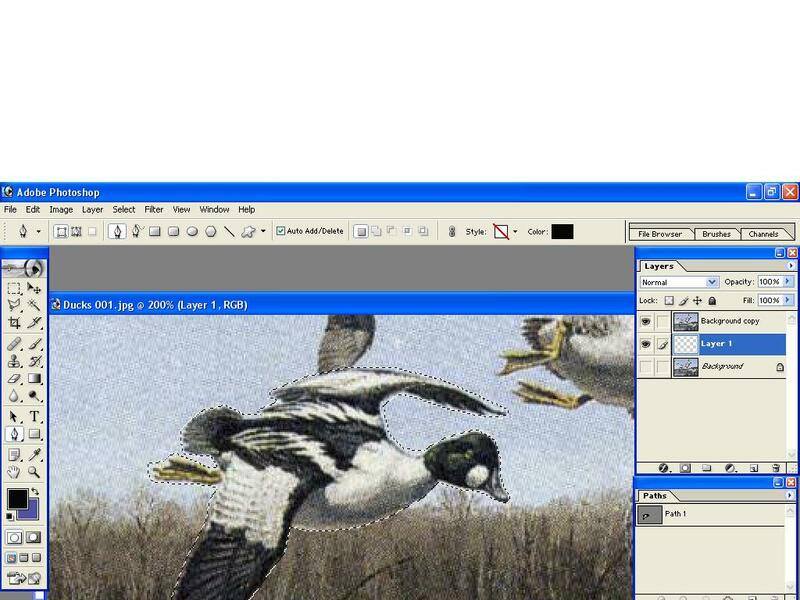 If you now click the eyes off on the layers one by one you'll see the birds disappear, it's a good idea to double click on the Background Layer name and give the birds names so that you know what is where. I'm going to move and resize my No 2 bird, so I click the eyes off on the other two. Don't forget YOU CAN'T WORK ON A LAYER UNLESS IT'S SELECTED AND BLUE! It's a bit too big so.....Edit > Transform > Scale. Holding down Shift and dragging any of the corners will scale up / down uniformly. Ok, i've reduced it, now i'm going to rotate it a little, Edit > Transform > Rotate. Grab any of the corners and rotate. Double click in the centre to apply. I'm going to do this with the other two birds and then position them where I think they will look good. To do this, click to show all of the eyes, select the 'Move' tool and move one bird at a time by selecting the corresponding Layers. If the birds lack definition, one at a time click, Image > Adjustments > Autolevels. and then, Filter > Sharpen > Unsharp mask. Tick Preview, set Radius to 1.9 and slide the Amount until the bird looks ok, but don't overdo this one. This is where I usually stop, print it off and draw a background scene in from imagination.....But, if you've no imagination, Try this. Edit > Transform > Scale. This time drag the side of it to fit, use the 'Move' tool to realign, etc. Select 'Scene' in Layers, click Opacity and move slider to about 47%, now there are better ways to do the next bit but this is easy to explain. Select the Erasor Tool,( Sixth one down on the left hand side) At the top tool bar select round brush at about 17 %, Opacity 100 %, then carefully erase the parts of the scene that are not needed. If you want to see it in greyscale. Image > Mode > Greyscale > Merge. If you just want a working drawing, ie. 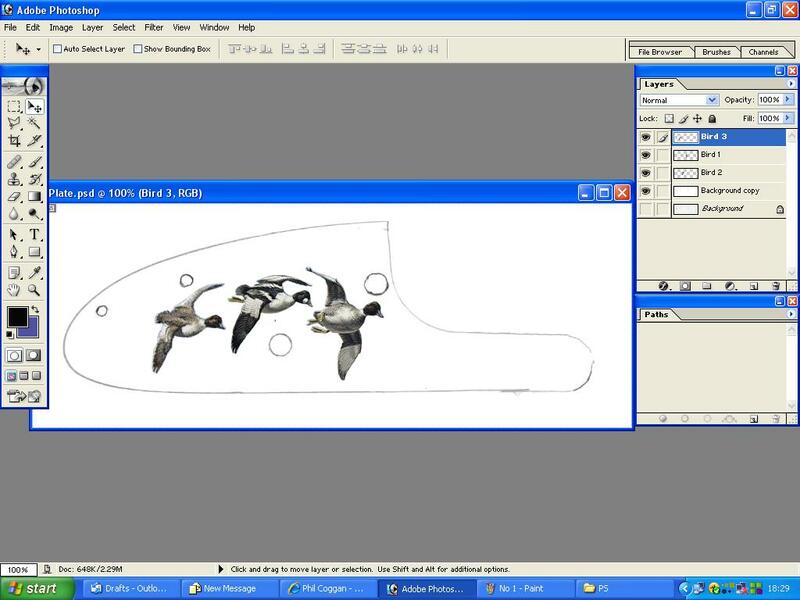 the birds without feathers and shading, just trace around the birds from the print, scan and import, then follow the sizing instructions as above. This might seem like a lot of work to some but once you get the hang of it, it becomes second nature and saves a lot of time. I think that's about it, i've checked most of this but if there's something i've missed I expect someone will tell me. great information Phil, thanks for doing this. this is great information for us that are learning. thank you very much. I also enjoy all of the pictures, it is great to be able to study the work of masters so that I have something to work toward, and learn from. Thanks, This is a real eye opener much appreciated. That is a fantastic job of showing us how do do a proper layout. It is very nice to speak with you again also. And I am grateful to you for allowing me to visit your workshop last year. I enjoyed meeting your family and seeing how Artists at the top of their field in England go about the daily work. Thank you very much for this marvelous contributionto the forum. Phil, If I ever win i couple million bucks you can do a H&H .700 for me!!! 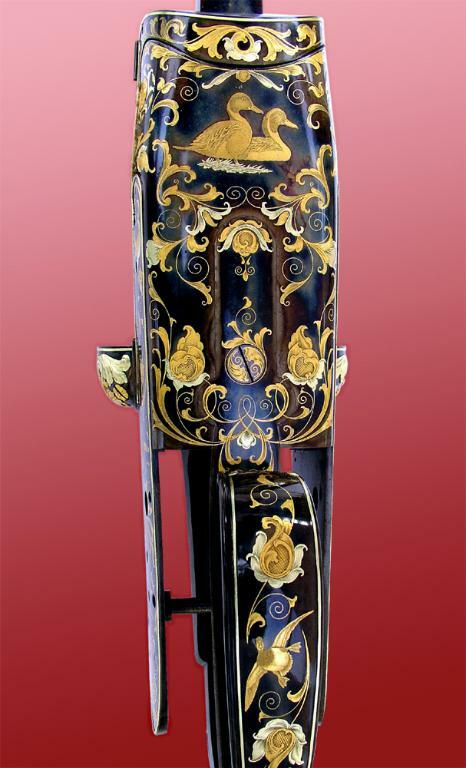 The first side lever gun is just amazing-it looks like it was made for a king or sultan or something. Your tutorial on photoshop was amazing too! I use it to touch up some old photos and people that I fixed them for were amazed, and I am pretty good at it, but you just showed me a whole new use for it. I am just a begginner, I can cut ok but my art work stinks. It is a lot easier to do it your way than to cut out little pictures and moving around behind tracing paper. Thanks so much!